Before the tasks – What can you expect in an SQL technical screening? There are two common ways an SQL tech screening can be done. The simpler but less common way is that you get a computer, a data set and a task. While you are solving the task, the interviewers are watching and asking questions. A little trial and error is totally fine, as long as you can come up with the correct solution in a reasonable amount of time. The other, more difficult (and by the way much more common) way is the whiteboard interview. In this case, you don’t get a computer. You have to solve the task and sketch up the code on a whiteboard. This means that you won’t get feedback (at least not from a computer) on whether you made a logical or a syntax error in your code. Of course, you can still solve the tasks by thinking iteratively (cracking the different SQL problems one by one), but you have to be very confident with your SQL skills. Note: there are other types of tech screening – like the take-home assignment – where you can prove that you can solve more complex coding challenges, too. Here are three SQL interview questions that are really close to what I actually got or gave on data analyst/scientist job interviews! Try to solve all of them as if they were whiteboard interviews! In the second half of the article, I’ll show you the solutions, too! Let’s say you have two SQL tables: authors and books. Create an SQL query that shows the TOP 3 authors who sold the most books in total! …and it has over one billion rows. Note: If the event_date_time column’s format doesn’t look familiar, google “epoch timestamp”! Write an SQL query to find out how many users inserted more than 1000 but less than 2000 images in their presentations! The company has 546 employees, so both tables have 546 rows. Print every department where the average salary per employee is lower than $500! The trick in this task is that you had to use the COUNT() function two times: first, you had to count the number of images per user, then the number of users (who fulfill the given condition). The easiest way to do that is to use a subquery. Write the inner query first! Run a simple COUNT() function with a GROUP BY clause on the event_log table. Make sure that you create an alias for the subquery (AS image_per_user). It’s a syntax requirement in SQL. Eventually, in an outer query, apply a WHERE filter and a COUNT() function on the result of the subquery. Note: You can solve this task using a subquery, too – but in an interview situation the committee will like the above solution better. Watch out: in the HAVING line, you can’t refer to the alias – you have to use the whole function itself again! Prepare for SQL tech screenings by practicing! If you managed to solve all these questions properly, you are probably ready for a junior or even for a mid-level Data Analyst SQL technical screening. 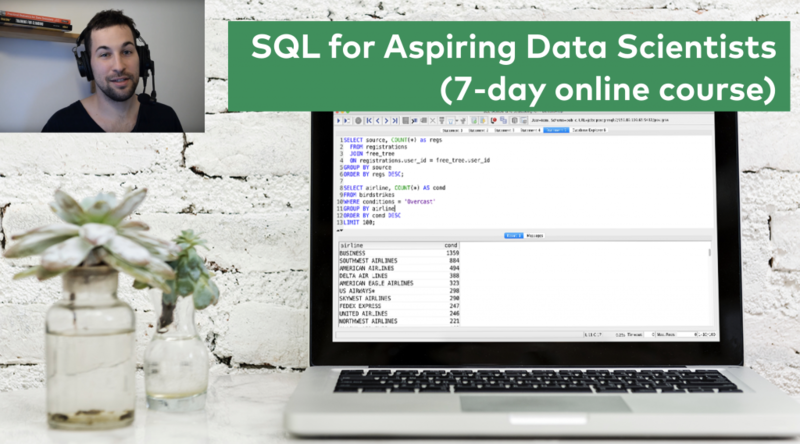 If not, let me recommend my new online course: SQL for Aspiring Data Scientists (7-day online course) – where you can level up (or brush up) your SQL skills in only 7 days. When you finish the course, just come back to this article and I guarantee that you will be able to solve these questions! 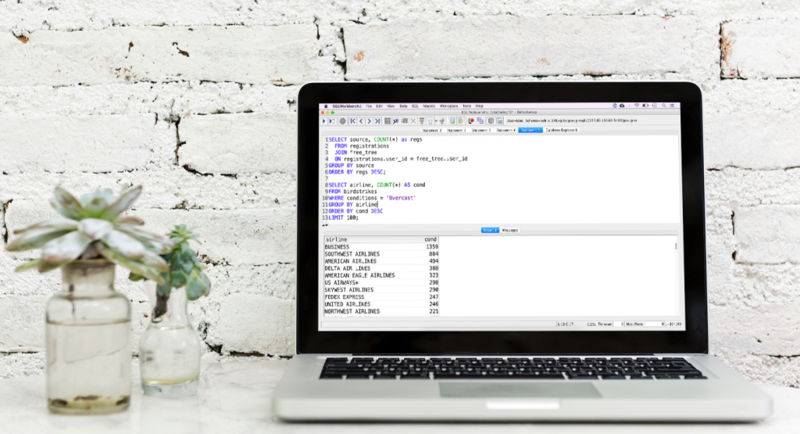 And if you are just about to start with SQL, start with my SQL For Data Analysis series on the blog! The hard part of these SQL interview questions is that they are abstract. The tasks say to “imagine the data sets” and show only a few lines of them. When you get an exercise like that, it helps a lot if you have seen similar datasets and solved similar problems before. I hope solving the tasks in this article will boost your confidence! If you have questions or alternative solutions, don’t hesitate to leave a comment. These three questions are very good. good question – and you are spot-on! You can use HAVING in the inner query instead of using WHERE in the outer query. The answer by Xiao is correct. You do not need a subquery for what you are asking for. Tomi, no offense, but you fail this question by simply overcomplicating things. thanks for the comment and none taken – comments with better solutions and with bug fixes are always welcome. I agree though that the WHERE clause from the outer query can go as HAVING in the inner query. These two commenters need to read the question a little better! Fun practice questions, thanks Tomi. Also, agree that these are great examples. To Xiao’s point, given that the selection is being grouped by user_id, you could simply look at the number of records in his query to find the count. Appreciate you posting these questions! Super helpful questions, Tomi. Thank you! It would be great if you can add a couple more practice SQL questions. Solution by Tomi Mester for question#2 is absolutely correct! Thanks Tomi for these practice questions. It helps alot. Thanks! : ) Glad you liked it!